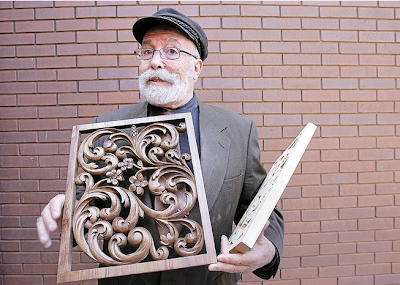 "Greek Artist Says Woodcarving His First Love"
This article was published in Tulsa World, April 14, 2012, written by Bill Sherman, the World Religion Writer. "Konstantinos Papadakis has been carving wood for 65 years, and he has no intention of stopping. His great-grandfather on the island of Crete lived to be 119, and when he reaches that age, he said, he will think about retiring. Papadakis was recently in Tulsa to talk with leaders at Holy Trinity Greek Orthodox Church about making a new, intricately carved 40-foot wooden screen to hold icons - holy paintings in the ancient Orthodox tradition. He is one of two candidates for the job. Papadakis said that since the death of his mentors, he is the last artisan who works in a unique Cretan-style of woodcarving. His love of woodcarving began when he was a 9-year-old boy sitting on his grandfather's lap in the village of Erkie, Crete, he said. A famous woodcarver on vacation in Crete noticed the pair and quickly carved an image of them in a piece of chalk. Amazed, Papadakis asked his grandfather how he could do it. " I have studied carved in wood and sculpture to artistic lyceum and currently I work in carpentry with classic furniture since three years years please if you need worker vi am willing to work with you and to work with a contract.